Two US organizations are cautioning everyone living in hurricane-prone areas to use caution and be prepared as the season enters its peak months, but at the same time announced that ocean and the atmospheric conditions are conspiring to produce a less active Atlantic hurricane season than initially predicted in May. For the entire season, which ends Nov. 30, NOAA predicts a total of nine to 13 named storms (winds of 39 mph or greater) of which four to seven will become hurricanes (winds of 74 mph or greater), including 0-2 major hurricanes (winds of 111 mph or greater). 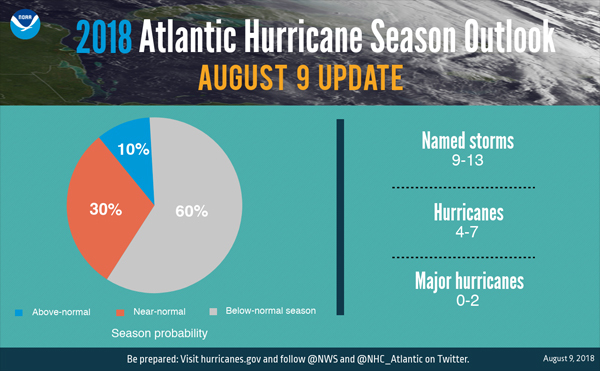 NOAA also urges coastal residents to make sure they have their hurricane preparedness plans in place and to monitor the latest forecasts as we move into peak hurricane season.